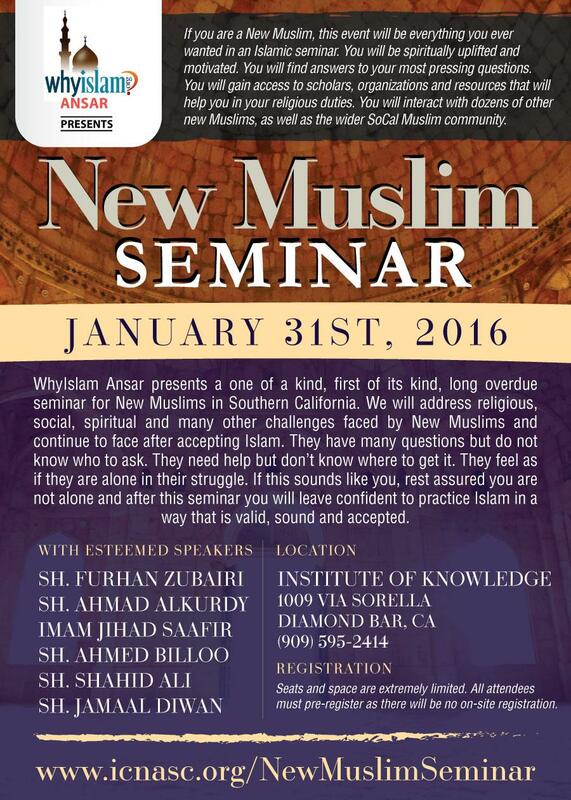 WhyIslam Ansar presents a one of a kind, first of its kind, long overdue seminar for New Muslims in Southern California. We will address religious, social, spiritual and many other challenges faced by New Muslims after accepting Islam. They have many questions but do not know who to ask. They need help but don’t know where to get it. They feel as if they are alone in their struggle. If this sounds like you, rest assured you are not alone and after this seminar you will leave confident to practice Islam in a way that is valid, sound and accepted. If you are a New Muslim, this event will be everything you ever wanted in an Islamic seminar. You will be spiritually uplifted and motivated. You will find answers to your most pressing questions. You will gain access to scholars, organizations and resources that will help you in your religious duties. You will interact with dozens of other new Muslims, as well as the wider SoCal Muslim community. The location for this year's seminar will be hosted by the Institute of Knowledge in Diamond Bar, Ca. The Institute of Knowledge is Southern California’s premier religious and academic institute which aims to inspire students in achieving excellence in both dimensions of knowledge; religious and academic, enabling them to become relevant, spiritual and scholarly leaders and professionals who embody an upright and noble character.